This article is an excerpt taken from a working paper authored by Sharini Kulasinghe, Lily Han, Takuya Hoshino, Abhishek Rathi, and Don Lambert, published by Asian Development Bank under the title - "Catalyzing Small and Medium-sized Enterprise Venture Capital in Sri Lanka | Publication | ADB South Asia WPS | No: 54, March 2018". Typically, equity investors exit their investments through trade sales (through the sale of their stake to strategic investors), secondary sales (stake sale to other private equity players), or through initial public offerings (IPO) on a stock exchange. The feasibility of these exit options is based on the depth of the local private equity and mergers and acquisition (M&A) environment. good starting point to understand directional trends in the M&A environment. M&A activity in Sri Lanka has been on a consistently upward trend: it has been dominated by strategic investors in the country, who accounted for over 90% of all controlling-stake transactions in the last decade and 55% of all non-control transactions in the data set we compiled (Figure 1). The high participation of strategic investors has been partly driven by the lack of private equity focused on Sri Lanka, which has begun to change (see section on Private Equity in Sri Lanka). Control transactions in Sri Lanka, where strategic investors acquire majority or full ownership of a company, have generally been relatively few over the last decade (less than $10 million, spread across the financial services, manufacturing, energy, and leisure sectors) with just a handful of deals over $50 million (primarily in the financial services and telecom sectors). The average buyout deal size has been around $15 million. A government-mandated push for consolidation in the financial services sector resulted in a spike of activity in 2014.
buyout such as TPG’s acquisition of Union Bank), particularly since strategic investors typically prefer controlling stakes. Foreign players have also been reasonably active, with 30% of buyout deals in the last decade has a cross-border angle. The increase in such transactions over the last decade suggests that while overall volumes remain low, there has been a gradual increase in the acquisition appetite by strategic investors accompanied by a similar shift in the mindset of Sri Lankan promoters toward selling out. Our market analysis suggests that this shift is particularly evident among second generation-run established SMEs and entrepreneurs running high-growth companies. In terms of minority stake sales, where investors acquire only a minority stake in a company, strategic buyers have been particularly active. As opposed to financial buyers, strategic buyers have accounted for more than half of aggregate non-controlling transaction volume during the last decade. The median size for minority stakes within the data set compiled for this study is $7 million—likely a materially overstated figure given a large number of smaller-sized transactions with unreported deal values. Initial indications suggest increasing activity in transactions involving minority stakes, with 15 taking place in 2016, making it one of the most active years on record (aside from the spike in 2014). After a period of relative inactivity, Sri Lanka’s private equity sector has witnessed growth in the last 4–5 years. Domestic private equity firms in the country were first launched in the early 1990s through a government-initiated push, mainly in the form of tax incentives. This led to the establishment of seven private equity funds by 1992, which collectively invested $20 million in 100 companies by the end of the decade . The subpar performance of these funds (a follow-up study by the United States Agency for International Development in 2000 categorized only 1 investment as a “success” and 60 as likely to be “lost”), the expiry of tax incentives, and the escalation of conflict then saw a marked decrease in activity, with no new domestic-focused funds launched until 2012. While 3–4 fund managers tried to raise funds right after the end of the conflict, they failed to generate sufficient limited partner interest. With transaction sizes generally inadequate to generate sufficient foreign investor interest and a dearth of local institutional financial investors, private equity activity slowed down considerably over 2000–2010. However, this has begun to change over the last few years. Two local private equity funds, Ironwood Capital and The Emerald Sri Lanka Fund, was launched in 2014 with $80 million in the aggregate capital and an increasing number of prominent international investors (e.g., TPG) have made investments in the last 5 years. 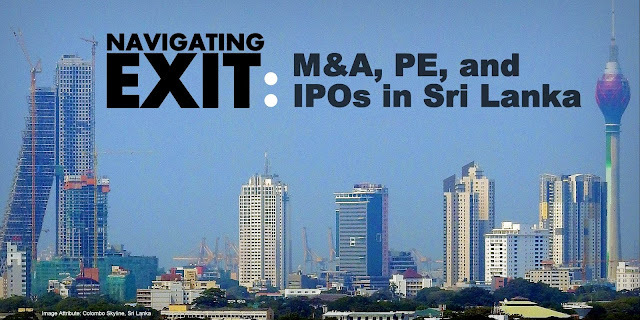 Additionally, several regional private equities funds have evaluated deals in Sri Lanka in recent years, with an aggregate private equity deal a volume of 20–30 investments since 2010. As such, private equity is increasingly likely to be a potential exit route for venture capital investors going forward (Figure 2). Sri Lankan public equity markets are relatively nascent, with some of the largest companies on the island still privately held. This is primarily due to the general impression of the lack of any material advantages to the listing, the requirement of publishing financials publicly, and the unwillingness to dilute equity. This, in turn, results in a moderately liquid market with few participants, with daily average aggregate market turnover at just $6.1 million during the first three quarters of 2017 across 295 listed firms on the Colombo Stock Exchange. Strategic investors have been the most active acquirers of businesses in the country over the last 10 years. The low participation of financial buyers has been driven by the very limited presence of Sri Lanka-focused private equity funds. However, recently, this has begun to change, with two Sri Lanka-focused private equity funds being established in the last 2 years, and regional and global private equity funds becoming increasingly active. As such, financial buyers are likely to play a more active role in M&A activity in the future. Based on the current environment, IPOs remain the least likely exit route for venture capital investments as their viability as an exit route is closely linked to the performance of the stock market. (i) Control transactions: There has been relatively steady activity in control transactions. While this has been dominated by local strategic players, international buyers have also been active. Attractive, scalable firms that have synergies with strategic investors could be prime acquisition targets. Local entrepreneurs are gradually becoming more open to a sale of control. However, as many remain reluctant to buyouts, successfully executing this exit route will require alignment early in the deal cycle. (ii) Minority stake sales: The significant number of minority stake sales over the past decade, and particularly the recent increase in deal activity suggests that there is increasing interest in these types of transactions. (i) There has only been a single notable private equity secondary sale in the last decade (Actis sold its stake in Asiri Hospitals to TPG in 2015). The dearth of local private equity players and limited interest from foreign funds made this an unlikely exit option in the past. (ii) However, the emergence of local private equity firms (primarily focused on midsize investments) and increasing interest from regional funds (which typically have a larger size mandate) makes this a more likely exit option going forward, particularly for SME investors. (i) IPO activity in the country has been directly correlated to the performance of the markets and therefore, the viability of an IPO as an exit route will be based on timing. Sharini Kulasinghe is a managing director at YSP Advisors, Sri Lanka. Lily Han, CFA is an investment principal at D. Capital, United States. Takuya Hoshino is a financial sector specialist at the Asian Development Bank (ADB). Abhishek Rathi is a vice-president at YSP Advisors, Sri Lanka. Don Lambert is a principal finance specialist, South Asia Department at ADB. This article is an excerpt taken from a working paper authored by Sharini Kulasinghe, Lily Han, Takuya Hoshino, Abhishek Rathi, and Don Lambert, published by Asian Development Bank under the title - "Catalyzing Small and Medium-sized Enterprise Venture Capital in Sri Lanka | Publication | ADB South Asia WPS | No: 54, March 2018" and it is licensed under a Creative Commons Attribution 3.0 IGO License provided by the original publisher. Bouri, Amit, et al., “The Landscape for Impact Investing in South Asia – Sri Lanka”, GIIN-Dalberg.